I hit a bit of a Beckett wall this month and came to understand why he is often called The Last Modernist – a view I have hitherto opposed. After a while the profound pessimism of his world view becomes quite hard to get around and even to see beyond. As a writer my own preoccupations are almost as far from Beckett’s as it’s possible to be. I’m interested in the connections between people and within people. How the past interferes with the present and what we do to ourselves to survive it. Beckett’s isolation in time and space leaves me at something of a loss. And yet, I kind of disbelieve him too. There are such warm glimmers of an intense relationship to life outside the given moment that I occasionally wonder if he allowed his intellect to talk himself into a corner and this was why he stopped writing novels. Certainly, there doesn’t appear to be any logical, formal progression possible from The Unnamable, without the kind of radical shift in perspective that he was unwilling or unable to make. Instead, he chose a particularly brutal form of self-restraint and it’s fascinating to watch the ever decreasing circles of his view as it gradually switches the oxygen off. I find myself admiring the result but wondering about the cost. 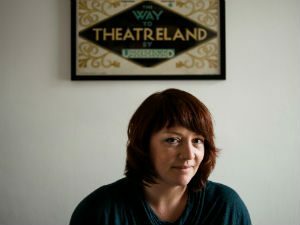 Multi-award-winning author Eimeer McBride is Reading’s first Beckett Creative Fellow, and has been given unique access to our internationally important Beckett Archive – the largest collection of publicly accessible Samuel Beckett materials in the world. This is her latest monthly journal entry about her experiences of working with the materials.